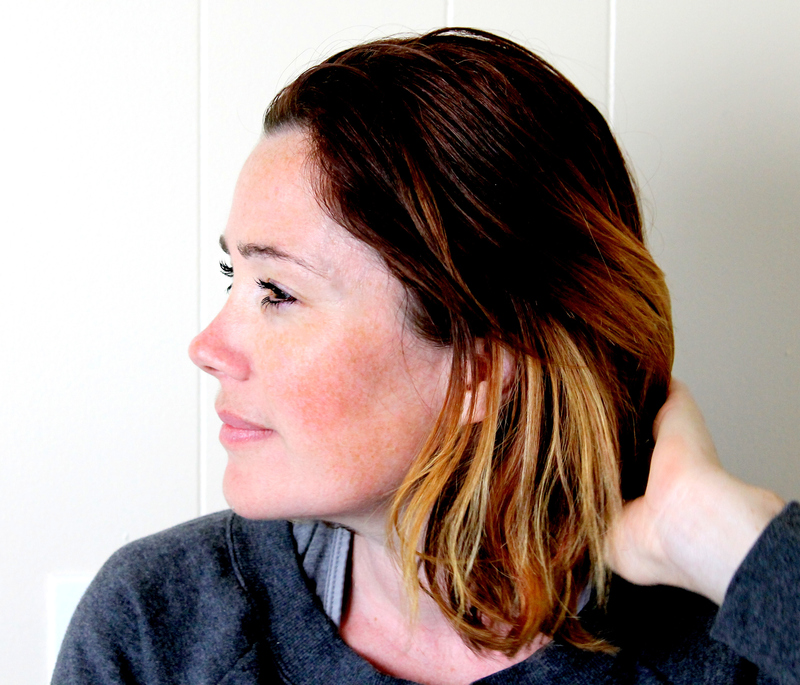 EMMA: The first time I felt Spoonflower’s new Modern Jersey, I thought, baby clothes! Its cozy, snuggly texture is soft against a baby’s delicate skin and the fun, modern designs available in the Spoonflower marketplace are perfect for creating unique baby clothes and accessories. 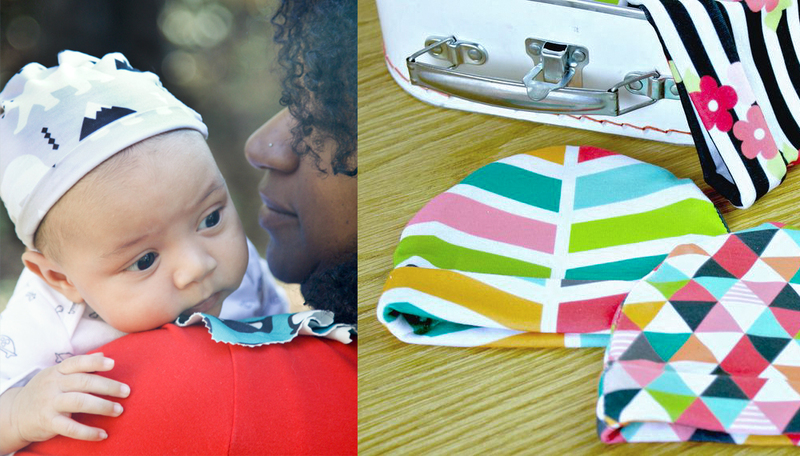 To make a newborn baby hat, start by selecting your fabric. For my hats I used Flowers and Black Stripes fabric by MintPeony, and Geo Girls Pinks and Girl Chevron by Natitys. 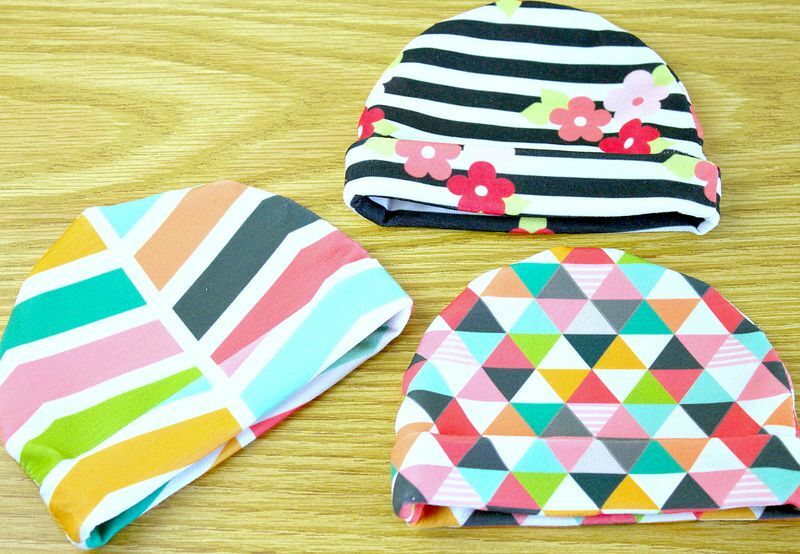 You can make at least two hats from one fat quarter of Modern Jersey (you can maybe eke out a third if you’re not worrying about matching directional prints at the seams). Then, print the hat pattern. Make sure to print the pattern at 100%. 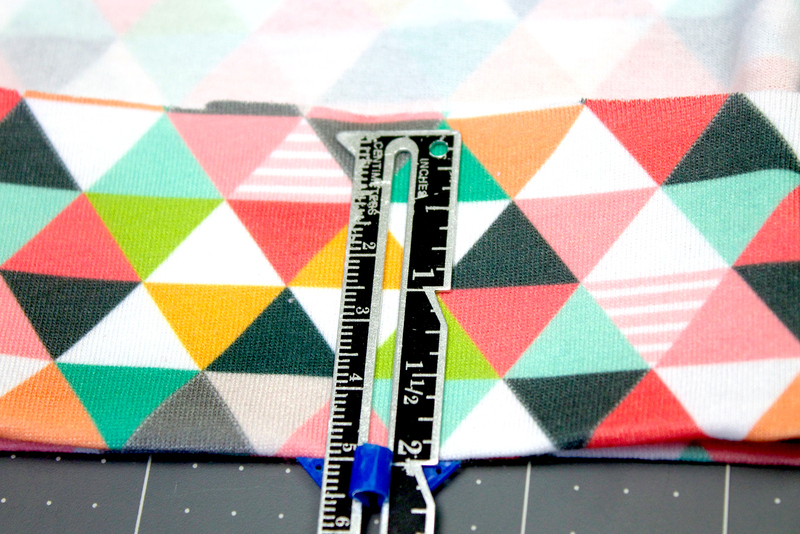 Check the 1” square on the pattern measures 1” x 1” after printing. NOTE: This newborn hat pattern is designed to fit a newborn with an average head circumference of about 13.5”. 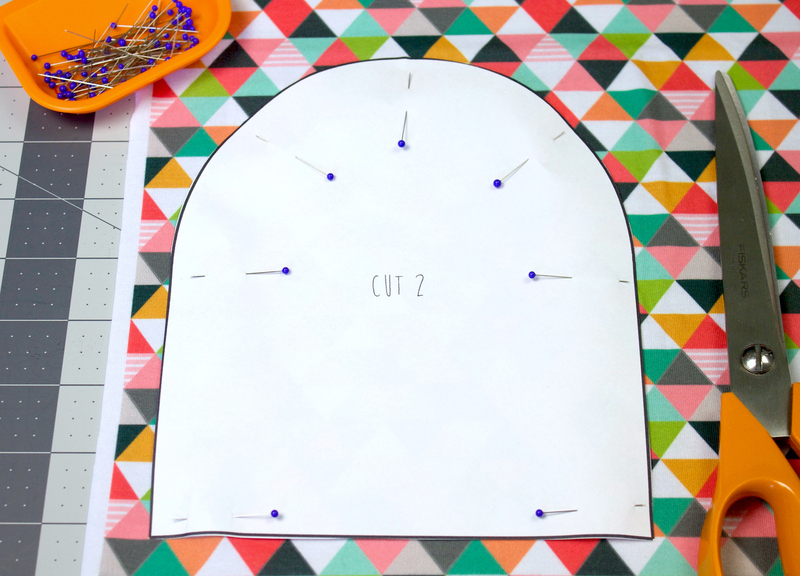 Pin the pattern to the fabric and cut 2 pieces. I prefer to cut one pattern piece at a time, so that I can make sure to cut along lines determined by the fabric design. Ultimately this gives a neater finish to your hats. 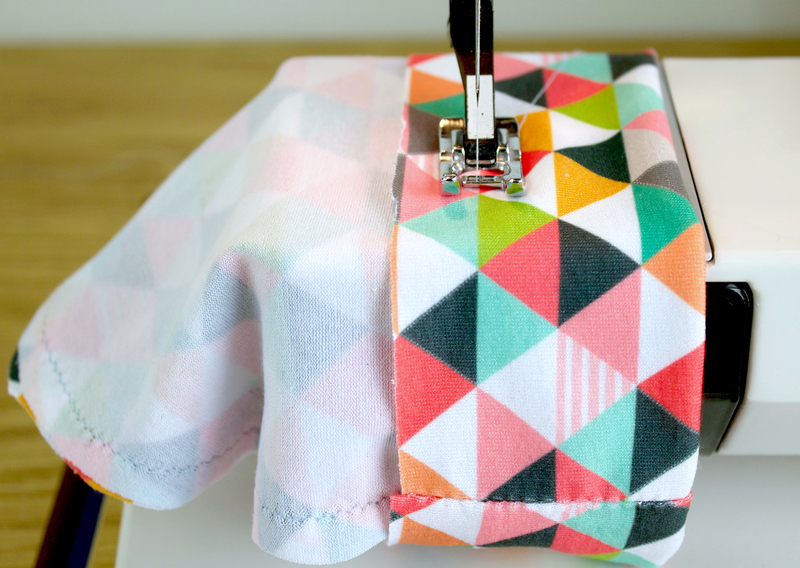 Pin the two pieces of fabric together, with right sides facing and set your machine up ready to sew knits. I like to use a loose zig zag stitch (length 3, width 1.5), and usually use a ballpoint needle. Sew the two pattern pieces together, leaving the bottom opening unsewn. Sew with the presser foot against the raw edges of the fabric to guide you around the curve of the hat and to give you a small ¼” seam allowance. Turn up the bottom opening of the hat 2” to the wrong side and press with an iron. 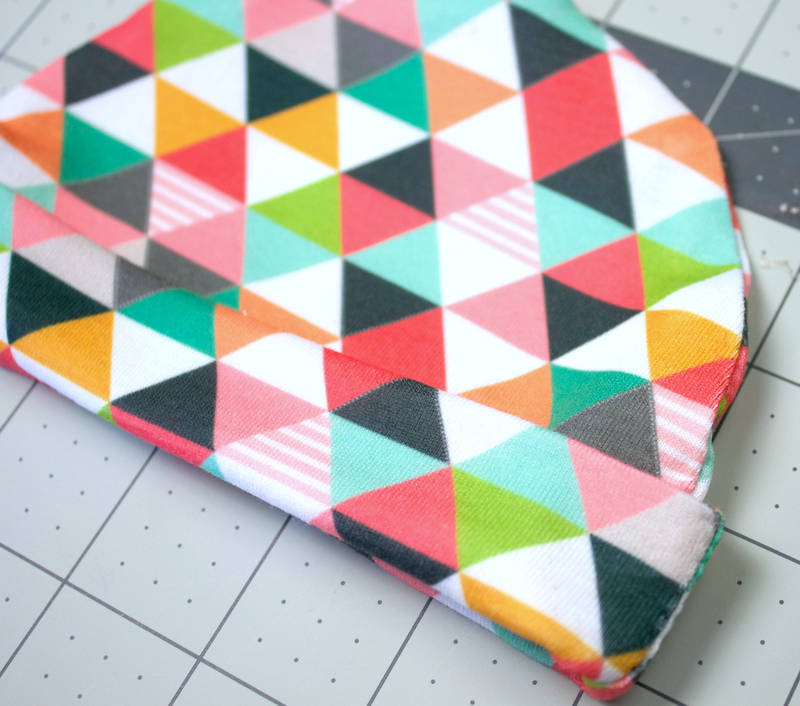 (I turned mine up slightly more than 2”, so that I was keeping in line with the fabric design). Sew the turn up all the way around the hat, about ¾” away from the raw edge. Turn the hat to the right side and gently press the seams. Fold up the bottom edge about 1” to the right side, to create a neat band around the opening of the hat. 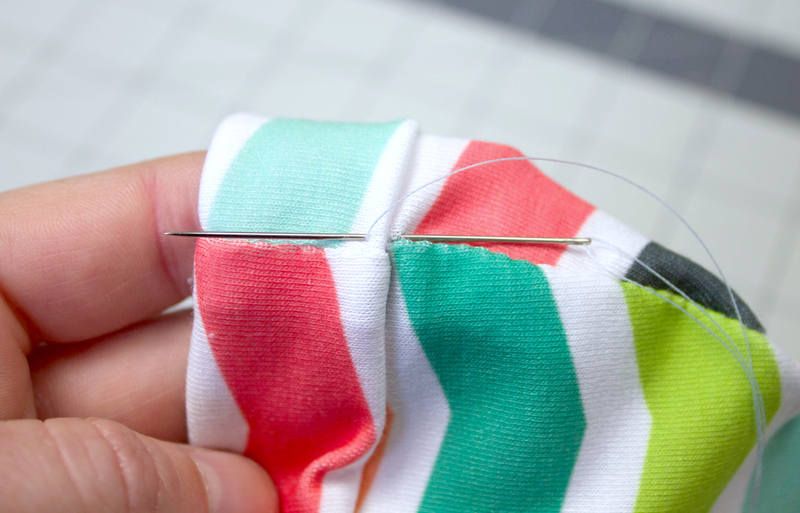 With a needle and thread, tack the turn up in place along the side seams to secure. Adorable !! 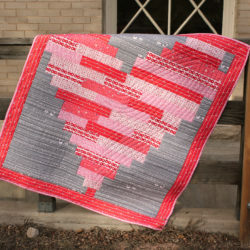 Can’t wait to make some, thanks for the tutorial and pattern ! What size ballpoint needle do you use? HI,can u please teach me how to make a pair of pyjamas for a one year old baby boy? We don’t have a specific pyjama tutorial, but we do have one on making soft and stretchy baby leggings made using organic cotton knit. 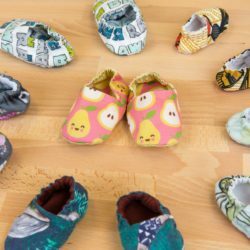 Visit the Spoonflower Marketplace for over 350,000 designs! Thank you for the tutorial and showcasing these beautiful knits. Hi Erika, I used size 12 ballpoint needle for sewing up these hats. We send your purchased items free of charge when you reach $50.00 or more. We guarantee the safety of our products and we will be sending off with your package our “wash & care” instructions. You can also contact us if you need to swap an item or wishes to return them for valid reasons. Thanks! And did you use a walking foot or just your regular foot on your machine? Amazing tutorial. What a great personalized gift. You could even add some hand stitched words to the rim of the hat to really set it off. Is it possible for you to share the measurements of the pattern? Height and width. Mine looks really small. 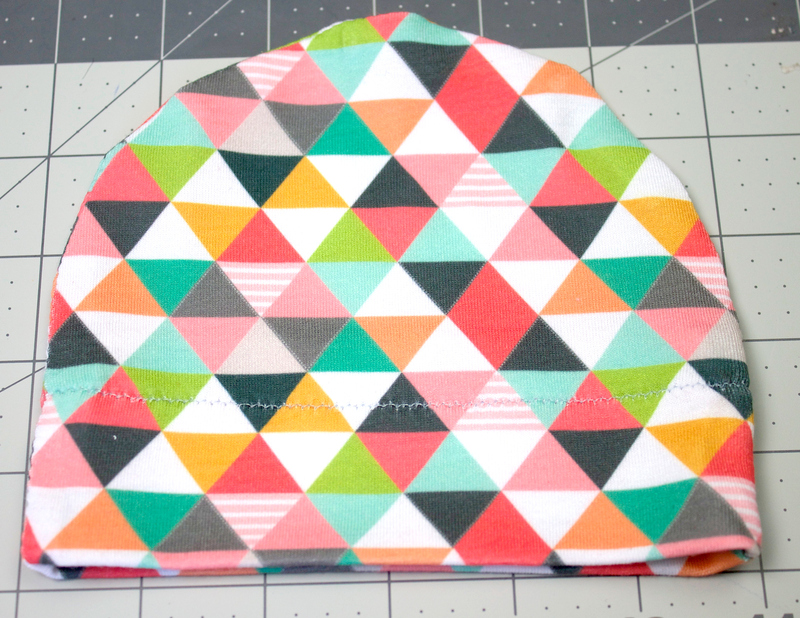 Do you finish the edge inside the hat…the edge you sewed 3/4 inch away from? Nice pattern.We can also add buttons and other decorative accessories on the hat. THIS IS PERFECT! I am running to the fabric store right now. and you make it look so easy. Been looking all over for a nice hat tutorial, i think this one is atuaclly doable! Do you happen to have a pattern for an adult size hat too? Do you have an adult pattern for this same hat by chance? I checked my square and using the 1/4 SA this pattern was TINY! I ended up having to trace a different hat that I had on hand just a different color that I needed. This was good for a preemie or a doll size. where do i get nice colorful knit fabric? Hi love your hats. 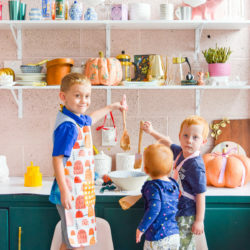 Do you have a pattern for 6 months and bigger nod for 4 and 5 year olds?? 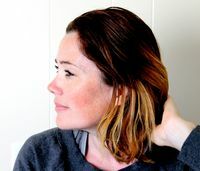 Hey Clare, unfortunately we don’t, but what I’ve done in the past to scale up this pattern is to trace a hat you already have that’s the right size and use that as a pattern. Alternatively you could borrow a hat from someone else or buy a very inexpensive one to draft your own pattern. 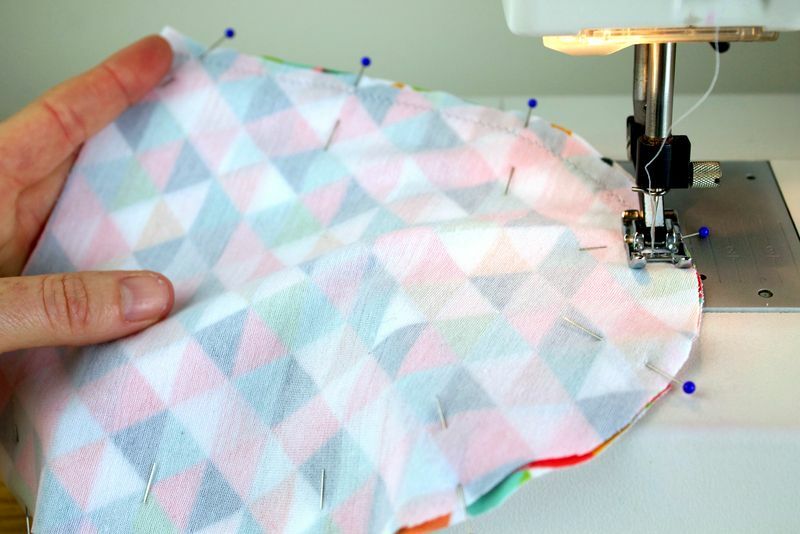 Wax paper or interfacing is perfect for tracing a pattern, too. Hope this helps! Facebook page if there is an interest? What is the length of the pattern? 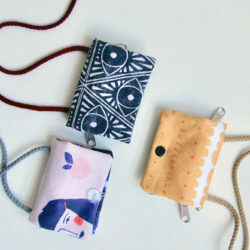 I am anxious to make some. The baby hat pattern is 7.5″ long. 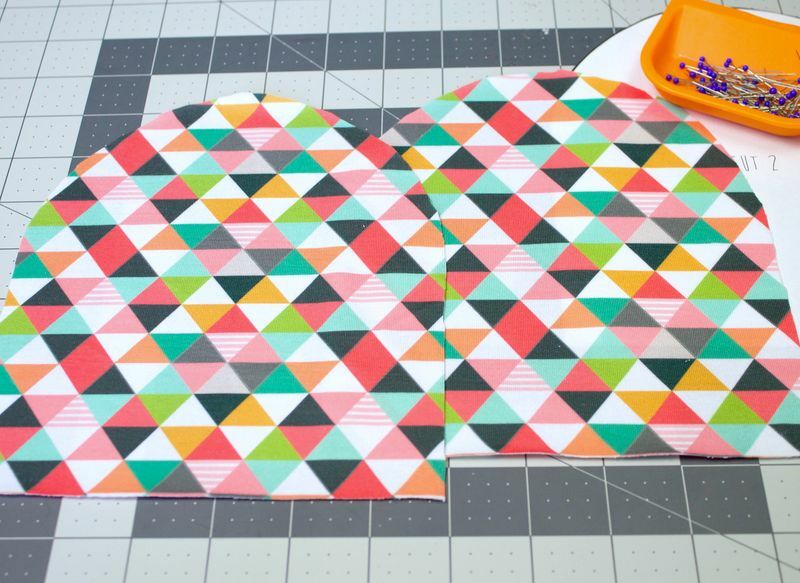 This is a great beginner-friendly tutorial and we think you’re going to love the finished results!